Goldenrod essential oil may not be the best known of the essential oils, but it has a variety of therapeutic uses ranging from urinary tract infections to skin care. Goldenrod is also known by its scientific name Solidago derived from the Latin word meaning ‘to make whole’. The plant is a perennial native to certain areas of Canada, Mexico, and the USA while a certain species is also native to parts of Europe. It is generally the Canadian plant (Solidago canedenis) which is used to make the essential oil that you can buy commercially. Goldenrod belongs to the family – Asteraceae. The plant was often confused with ragweed and unfairly blamed for seasonal allergies however its sticky pollen is so heavy that it does not float on the air, instead it is pollinated by insects. Goldenrod contains various flavonoids and saponins and has similar properties to a number of other herbs. These include antifungal, anti-inflammatory, circulatory, diuretic, carminative and expectorant properties which give it a variety of therapeutic benefits. Historically goldenrod has been used to treat bacterial inflammation and as a tonic for the kidney. There is also evidence that Native Americans treated a toothache and sore throats by chewing on its leaves and roots. The flowers of the goldenrod plant are steam distilled to produce the essential oil. Thomas Edison used the goldenrod hat he cultivated to produce rubber. Henry Ford gave Thomas Edison a Ford Model T with tires produced from goldenrod. The plant was used as a dowsing rod to find water. Goldenrod was thrown into the Boston harbor at the time of the Boston tea party. Colonists drank tea made from the plant for their health. There are over 130 different goldenrod species within the genus. Goldenrod is the state flower of Kentucky, Alabama, and Nebraska. 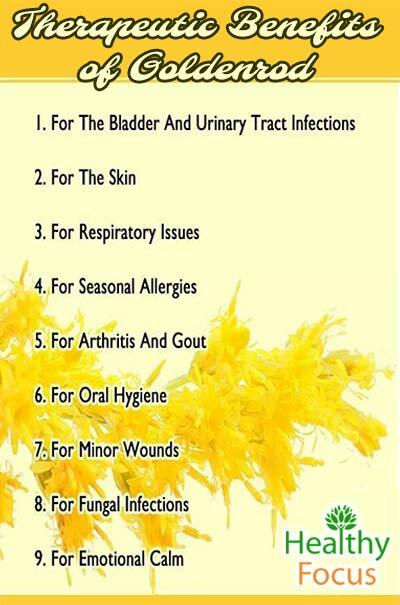 Its scientific name – Solidago means to ‘make whole’ or ‘to heal’. Goldenrod is also known as woundwort. One of the main traditional uses of goldenrod was to treat infections of the bladder and the urinary tract. There is actually some scientific evidence that the plant is effective in treating these complaints which supports its traditional use. The German commission has actually approved the use of goldenrod to treat urinary tract infections. It has diuretic properties meaning that it can help stimulate the production of urine and increase the frequency of urination as well as antiseptic and astringent properties which help tone up the urinary tract. It is also said to be a tonic for the kidneys which works by nourishing them and restoring balance and health. Here is what German researchers had to say about the potential of goldenrod in urinary tract conditions. As long as you make sure to dilute this essential oil in a carrier oil like coconut or sweet almond, then it can be applied topically to the skin to help treat inflammatory skin conditions like acne and eczema. Goldenrod has antiseptic and astringent properties that might help clean and tighten your skin. So even if you are not suffering from any particular skin condition, goldenrod essential oil may help you look fresher and younger. Because goldenrod has expectorant properties, it can be inhaled either directly from the bottle or your hands to help ease congestion caused by blocked sinuses or the cold. When inhaled, it should help loosen any build-up of mucus and help you to breathe more easily. The plant has also been used for centuries by the Native Americans to ease respiratory problems and treat sore throats. It is ironic that a plant which in the past was mistakenly blamed for causing allergies is now seen as an effective treatment for the unwanted symptoms of hay fever. Goldenrod essential oil can help ease your runny nose and watering eyes and put a stop to the sneezing which many people experience during the late summer period. If you suffer from painful inflammatory joint conditions such as arthritis and gout, you can massage a combination of goldenrod and a carrier oil into the affected areas of your body. Because of its anti-inflammatory qualities, goldenrod oil might also help ease aching muscles following exercise or a hard day on your feet. As we mentioned earlier in the article, the leaves of the plant were traditionally chewed by Native Americans in order to ease the pain of a toothache. The essential oil can be used as a mouthwash to help kill oral infections and ease any pain. Simply add a few drops of goldenrod essential oil to a glass of water and gargle the mixture a couple of times each day but be very careful not to swallow any of the mixture as this essential oil should not be ingested. So long as you ensure to dilute your goldenrod oil, it can be used on minor wounds, burns and insect bites to clean the wound, ease any inflammation and prevent infection from taking a hold. You should, however, be careful not to apply it to a more severe open wound and make sure that you see a doctor if your wound is serious. 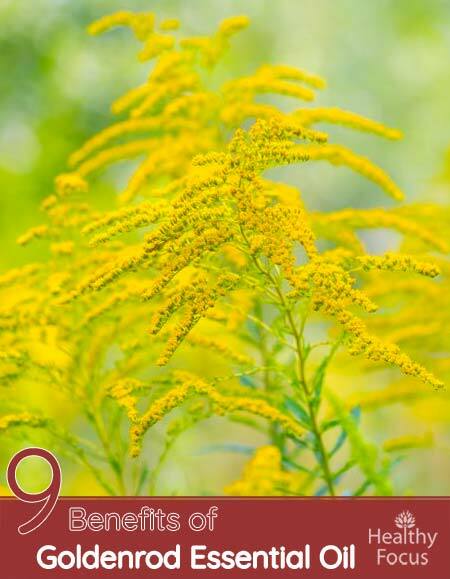 Goldenrod essential oil contains antifungal properties and might be useful in treating yeast infections such as candida as well as athlete’s foot, jock itch and toenail fungus. However, there are more potent antifungal essential oils such as tea tree oil that would serve the purpose better. Like so many other essential oils, you can simply diffuse goldenrod oil or apply a little to the shoulders, neck and bottoms of your feet to help you unwind from a stressful day. Goldenrod essential oil has a delightful scent which is both citric and a little peppery. Simply diffusing it in your home or office might have a calming and uplifting effect on your mind and set you up well for the day. It can also be diffused to rid your home of nasty odors caused by environmental pollutants, tobacco or cooking. There are a variety of ways to use goldenrod essential oil depending on what condition you are attempting to treat. For respiratory conditions or allergies, you can inhale it in several ways. The easiest way to inhale essential oils is by inhaling it directly from the bottle or putting a few drops on a handkerchief and breathing in its fumes. You can also add a few drops to the palms of your hands and cup them over your nose. A very effective method of relieving your airways and clearing the excess build-up of mucus is to add 5 or so drops to a sink full of hot water. Cover your upper torso and head with a towel and breathe in the vapors for as long as you can tolerate it. Combine your essential oil with a good quality base oil such as coconut, jojoba, sweet almond or avocado oil and massage the blend into your aching muscles or joints. Even if you are not suffering from a specific complaint, goldenrod essential oil makes for a very relaxing massage experience. If you have a diffuser machine, you can add a few drops to the machine either alone or in combination with another oil and let the vapors wash over you. It should promote calm, mental clarity and general wellbeing. Goldenrod essential oil blends well with ylang ylang, juniper, lavender, bergamot, clary sage. rosemary, rose and orange essential oils. READ What is the Best Kava Root Supplement in 2017? What is goldenrod essential oil mostly used for? Goldenrod essential oil has been approved by the German Commission E for the treatment of urinary tract infections. It is also a popular treatment for respiratory conditions, arthritis, and seasonal allergies. Is goldenrod essential oil good for your skin? Absolutely. Goldenrod can be applied to the skin to help treat common inflammatory skin issues like eczema and acne. It can also help your skin look younger and fresher. This oil can also be applied to minor wounds to help prevent infections from taking hold. What are the therapeutic properties? Goldenrod essential oil has antifungal, anti-inflammatory, diuretic, tonic, circulatory, carminative and expectorant properties. Goldenrod essential oil is considered safe when applied topically combined with a carrier oil or inhaled. However, it should never be taken internally. Can I use goldenrod essential oil on pets? Yes you can. Let your pets inhale it from your palms or directly out of the bottle. Do not let your pets lick any of the oil from your palms. The flowering tops of the goldenrod plant (Solidago canedenis) are usually used to produce the essential oil. What oil does it blend well with? Like most essential oil, goldenrod can be combined with various other oils for even greater effect. It blends well with ylang ylang, lavender, bergamot, juniper, and rosemary to name a few. Goldenrod essential oil is a good all-around healing oil with a number of applications both physically and emotionally. Effective for urinary tract infections, arthritis, and respiratory health. Inhaling this oil can effectively relieve stress and boost your mood. Skin friendly with antibacterial properties that can treat various skin conditions. Delightful fragrance and blends well with a number of other oils. The oil itself has not been extensively studied. Some people may be allergic so always perform a pacth test before applying goldenrod essential oil topically. Do not ingest goldenrod essential oil as there is no evidence to guarantee its safety. Always dilute the oil with a carrier oil before applying it to your skin. Before applying it for the first time, you should perform a patch test on a small area of your skin to make sure that you are not sensitive.